Extra police have been ordered into suburbs in the French capital, Paris, on the first anniversary of two deaths which sparked riots across the country. 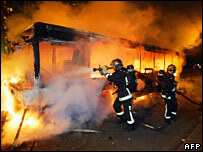 An additional 4,000 officers were deployed amid reports two more buses had been attacked and set ablaze. Earlier, at least 500 people marched in memory of the two teenage boys, both from immigrant families, who died. Their deaths and the suggestion they had been running from police triggered three weeks of suburban clashes. During the violence - between youths of mainly North African origin and police - more than 10,000 cars were set ablaze and 300 buildings firebombed. Ahead of the anniversary police had reported an upsurge in violence. On Thursday, two buses were set ablaze. In the latest incidents, at least two more buses were set on fire. Two armed men forced passengers from a bus in the northern Parisian suburb of Blanc Mesnil, before burning it. A second similar attack took place in the same suburb shortly afterwards, police said. 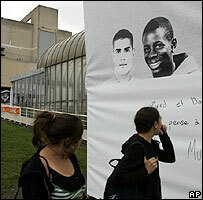 "What happened is four guys attacked Bus 346," witness Thierry Ange told the Associated Press news agency. "They made everyone get off, then they hit a woman and dragged out the bus driver by his tie," he said. Both vehicles were destroyed, but there were no reported injuries. Earlier, several hundred people marched through the suburb of Clichy-sous-Bois, where the riots started. The families of the two dead youths, Bouna Traore and Zyed Benna, laid wreaths at the electricity sub-station where they were electrocuted. A monument to the boys was unveiled and the local mayor appealed for calm. "Last year we crossed Clichy by weaving between the burnt-out wrecks of cars, creating an image of our city that we didn't want to see," said mayor Claude Dillain, quoted by the Associated Press. "Once again France, and even the world, is watching us and waiting to see what we do. So I appeal solemnly for calm and dignity to prevail here." But others have warned that factors which played a key part in the riots - high unemployment, discrimination and youth alienation from mainstream society - remain unchanged. "What is being done in order to ensure Clichy does not have three times as many unemployed as the rest of France?" Mr Dillain's deputy, Olivier Klein, asked.